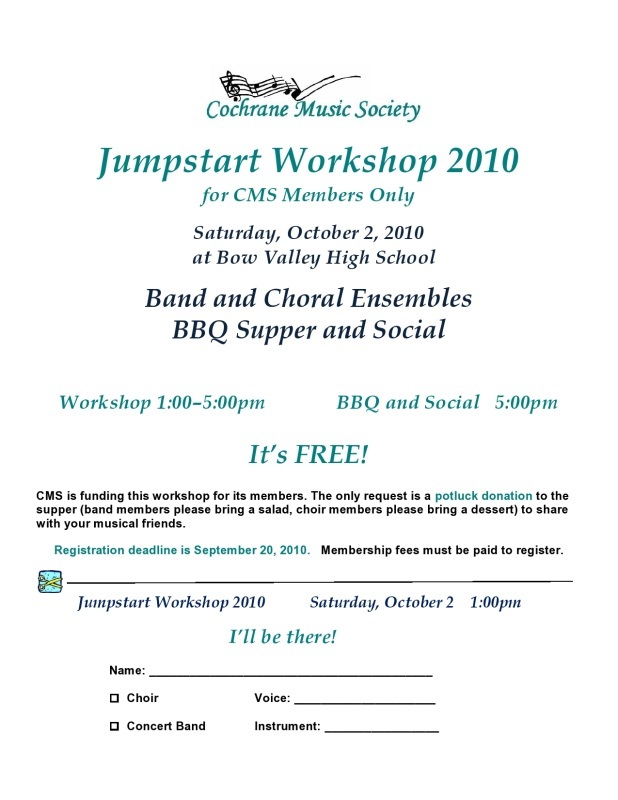 Jumpstart Workshop is back with concert band and choral ensembles, but this year it is just for CMS members. Riverside Jazz members – please join the concert band…or the choir if you prefer. Click to enlarge. Right-click to print. Rob Billington and the guest conductor will each have time with both ensembles and will focus on pieces that we are preparing for our concerts. The workshop will help us to develop our ability to express the interpretation that each conductor brings to the music. A delicious BBQ supper and fun social will follow the workshop. Take advantage of this opportunity to get to know people from other ensembles. CMS is funding this workshop for its members. The only request is a potluck donation to the supper (band members please bring a salad, choir members please bring a dessert) to share with your musical friends. Registration deadline is September 20, 2010. 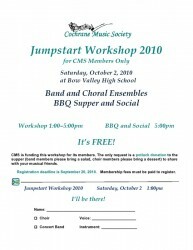 Jumpstart Workshop 2010 will only run with a high level of participation. Membership fees must be paid to register. Either respond to the news post, or print and complete the poster-form and give it to your ensemble representative.